Among the enchanting gorges of Pokhara, rests The Fulbari Resort & Spa, the ultimate blend of contemporary international standards and time-honored traditions. The Fulbari resort has 165 air conditioned rooms, exquisitely appointed guests rooms. Among the hotel's 7 different wining and dining outlets, is the bright, all-day coffee shop that opens onto wide west facing terraces. Fronting the entire View Point Beer Garden and the Green Canyon, are is resort's world-class the convention complex fully equipped with state-of-the-art audio-visual fixtures and equipment, and a supporting business centre with professional back up. The Fulbari Resort is the only resort in Pokhara to have its own golf course. 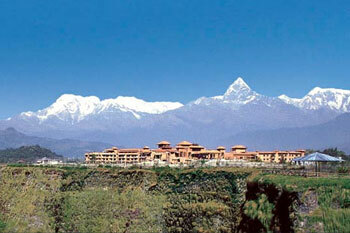 The Spa is the first and only international spa of its kind in Nepal. It is where you can unwind, relax and let the stress float away with immaculate spa therapies, yoga and meditation. Other recreational facilities include discotheque, snooker, tennis, swimming pool, health farm and the like. Continental breakfast served in Cafe Fulbari. Scheduled shuttle service to lake side & Pokhara city. Tax: All above rates are subject to 10% Service harge & 13% VAT Extra. Rooms will be held until 1500 hours on the day of arrival unless pre-requested otherwise.